Jo Isaac is a zoologist turned science writer and unschooling mom to Kai. She, ten-year-old Kai, and her husband Brett, live and learn in Melbourne, Australia. 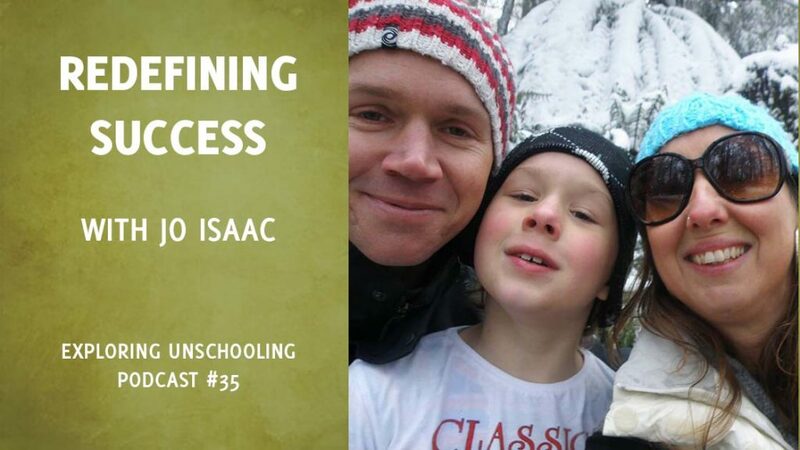 Her path of learning and unschooling has taken a number of interesting twists and turns and I really enjoyed hearing about some of them as we chat about ways we come to redefine success as we embrace unschooling. I’d love to hear about what your son is up to. What is he interested in right now? How is he pursuing it? What was the definition of “success” that you heard growing up? And where have you taken the idea of “success” since? The shift to seeing college as a choice, rather than a fixed landmark on the conventional path to success, can be challenging. It can feel almost neglectful at first, can’t it? One of the things I’ve found interesting is how differently the conventional focus on pursuing success in and of itself, and the unschooling focus on pursuing personal goals, play out, for both children and adults. Has that been your experience as well? How is life different now that conventional measures of success no longer play a key role? School has trained most people to believe that work—and school is presented as work for children—is not fun. That’s what weekends are for. Even in the dictionary, work and fun are antonyms: opposites. I think unschooling turns that idea on its head. Has that been your experience? Can you share with us a quick overview of what it’s like to unschool in Australia? What are the legalities? Are there active local communities?